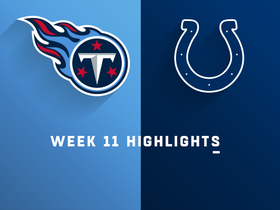 Firkser hauled in his lone target for eight yards in Sunday's 33-17 loss to the Colts. Firkser hauled in two of his three targets for 16 yards in Saturday's 25-16 win over Washington. Analysis: Firkser failed to take advantage of the absence of Jonnu Smith (knee) for the second consecutive week. After catching at least three passes in four consecutive weeks, Firkser has just two catches in the past two weeks for a total of only 16 yards. His brief fantasy relevancy appears to have already disappeared. 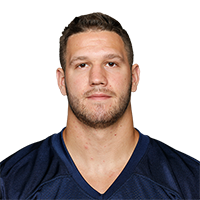 Anthony Firkser is likely to see an increased role with Jonnu Smith and Delanie Walker both sidelined, Jim Wyatt of the team's official site reports. Analysis: Speaking at Monday's press conference, coach Mike Vrabel said of Firkser, "I think we have to get Anthony in there more, regardless of who is healthy." While MyCole Pruitt and Luke Stocker will be available to play, they have both made negligible contributions in the passing game. That leaves Firkser -- who has recorded at least three receptions in each of his last four games -- as the most likely candidate to fill in as the primary receiving option at the position on Sunday against the Giants. Firkser caught all three of his targets for 27 yards in Thursday's 30-9 win over the Jaguars. 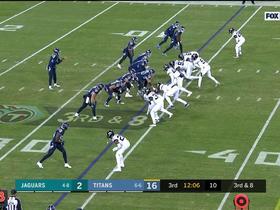 Analysis: Firkser's night was highlighted by a 16-yard reception late in the game that gave the Titans a new set of downs and allowed them to run out the clock to end the contest. He has now recorded at least three receptions in four consecutive games, and has become at a consistent part of the Titans' passing attack. Jonnu Smith (knee) exited the game early, and if he misses any game action, Firkser appears likely to serve as the primary tight end. Firkser caught all three of his targets for 42 yards and a touchdown in Sunday's 26-22 win over the Jets. Analysis: Firkser made a couple of key catches in Sunday's performance, though none was bigger than his 12-yard touchdown reception -- the first of his career. He also recorded a 25-yard reception that led to the Titans' game-winning score. Though he hasn't posted gaudy stats, Firkser has steadily seen his involvement in the passing game tick up, earning three or more targets in three consecutive games. Firkser caught all four of his targets for 52 yards in Monday's 34-17 loss to the Texans. Frikser caught all three of his targets to total 44 yards in Sunday's 38-10 loss to the Colts. 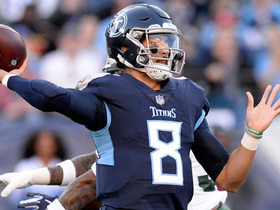 Analysis: Firkser was on the receiving end of the Titans' longest offensive play when he hauled in a 28-yard pass from Blaine Gabbert late in the fourth quarter. The game was already decided at that point, and it is worth noting that all three of Firkser's targets came with Gabbert under center rather than Marcus Mariota (stinger). Considering this performance was the height of Firkser's productivity, it's unlikely that he'll be counted in more meaningful game situations and with Mariota under center. Firkser caught his only target of the game for 11 yards in Sunday's 34-10 win over the Patriots. 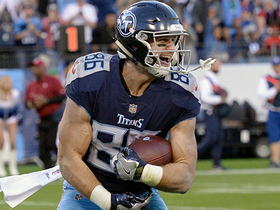 Analysis: Firkser was brought down just shy of the end zone on his lone catch, but did set up a 2-yard touchdown run by Derrick Henry that put the Titans up 24-10. Since being promoted to the active roster Oct. 8, Firkser has made three catches for 36 yards. 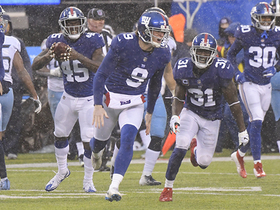 After bobbling the snap on a designed punt play, New York Giants punter Riley Dixon improvised and ran the football himself for a first down before halftime. Tennessee Titans quarterback throws a 10-yard pass to tight end Anthony Firkser. Tennessee Titans quarterback Marcus Mariota hits his tight end Anthony Firkser for 25 yards. Tennessee Titans quarterback Marcus Mariota slings a pass to his tight end Anthony Firkser for a 12-yard touchdown.